Anyone who has to reduce the amplitudes of RF signals in a controlled manner needs an attenuator. Linearly adjustable attenuation networks using special PIN diodes are available for this, but they require quite intricate control circuitry. A simpler solution is to use an integrated attenuator that can be switched in steps. The RF 2420 is an IC built using gallium-arsenide (GaAs) technology, which works in the frequency range between 1 MHz and 950 MHz. It can thus be used as an attenuator for cable television signals, for example. The attenuation can be set between 0 and 44 dB in 2-dB steps. An insertion loss of 4 dB must also be taken into account. This base attenuation can be measured in the 0-dB setting, and it forms the reference point for switchable attenuation networks that provide 2, 4, 8, 10 and 20 dB of attenuation. These are all controlled by a set of 5 TTL inputs. The control signals must have Low levels below 0.3 V and High levels of at least +2.5 V. The RF 2420 works with a supply voltage between +3 V and +6 V, with a typical current consumption of 4 mA. A power-down mode, in which the current consumption drops to 0.8 mA, can be activated by removing power from the bussed VDD- pins. 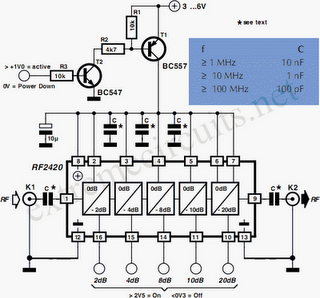 The sample circuit diagram for the RF 2420 shows that the only external components that are needed are decoupling capacitors. The coupling capacitors at the input and output determine the lower operating frequency limit. The table lists possible capacitor values. The input and output are matched to 50-ohm operation, but they can also be used with 75-ohm cables with a small increase in reﬂections. The RF 2420 is available in a 16-pin SOP-16 SMD package. Its data sheet can be found at ww.rfmd.com.